In 1949, the peak year for immigration, “Israel” absorbed approximately 111,000 new immigrants. 47 percent of that year’s total came from North African or Middle Eastern countries. The start of 1949 to mid-1950 is generally known as the beginning of the immigrant camps, which were frequently kept under governmental lock and key. At the beginning of 1949 28,000 lived in immigrant camps, by mid-year, that number had grown to 60,000, and the total reached 100,000 by the end of the year. Dr. Giora Josephtal, then head of the Absorption Department of the Jewish Agency, told other Mapai (Labor Party) members that of that 100,000 approximately 75% were immigrants from Islamic countries, other living under extremely difficult conditions. Many were housed in tin-roofed cinderblock huts, tents or other makeshift structures, many of which were deemed fit only for storage by the recently departed British Mandate. The British would never have thought to house human beings under such conditions. In addition, sanitary conditions in the immigrant camps were, according to all opinions, atrocious: entire camps, housing thousands of immigrants, were put up with hardly any plumbing, with only a few water faucets, without showers, and with scant toilet facilities. It was under these trying circumstances that thousands waited to see what fate “Israel” would decide for them. All of this was taking place in an environment rife with anti-religious sentiment and condescension towards Jews from North Africa and the Middle East. The “last refuge” of the Jews turned out to be far less inviting than the one Jewish Agency representatives had portrayed in their Aliyah campaign visits to Algeria, Yemen, Iraq, Morocco, etc. The scene was somewhat less messianic and romantic, especially for those Jews who hailed from what Ben-Gurion and other Mapai members termed “primitive” lands. The overall Geist of “Israel” at the time attached a severe stigma to these immigrants who, in the vast majority of cases, moved to the nascent state out of necessity rather than political conviction. Their countries of residence had been made uninhabitable, in large part due to Zionist provocations, so they made their way to the only country that was allowed to welcome them. For their part, “Israel” was happy to use them as border cannon fodder. The situation understandably led to mass disillusion amongst the immigrants, who in many cases had led normal, prosperous lives in their countries of origin. To top it off, they were now the official disdained minority, a useful scapegoat for the new government. Haaretz columnist Aryeh Gelblum deftly painted public and governmental opinion of the time. 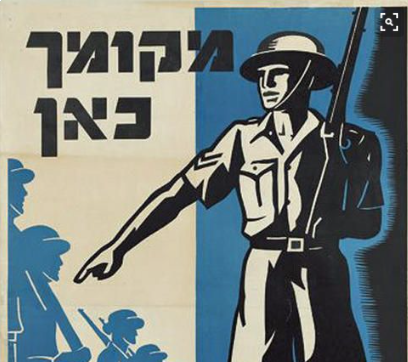 Though the commission greatly downplayed the extent of anti-religious coercion amongst Jewish immigrants from Islamic countries in the transit camps, even they couldn’t save enough face to prevent a vote of “no-confidence” from toppling “Israel’s” first elected Knesset coalition government in the months following the publishing of the commission’s findings. Their downplaying was incriminating enough.